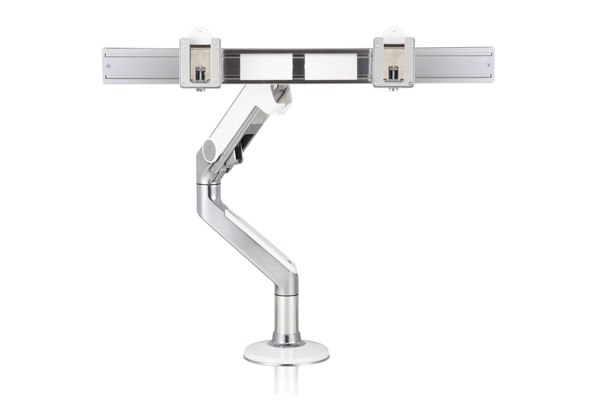 The Dual Monitor Arm by Humanscale-M8.1 The M8.1’s high weight capacity allows it to easily accommodate dual-monitor applications. Using an optional crossbar, the M8.1 supports two monitors—each weighing up to 14 pounds—arranged side-by-side. With a built-in fine-tune adjustor, each monitor can be adjusted for perfect alignment, creating easy viewing and a smooth aesthetic. Monitors mounted to the crossbar adjust simultaneously, allowing the user to easily re-position the entire configuration and improving the ergonomics of multiple-user workstations.